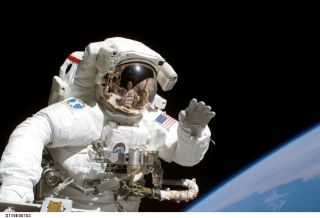 Astronaut Joseph R. Tanner, STS-115 mission specialist, waves at the camera during a space walk. NASA will be seeking applications for astronauts starting in December. Calling all aspiring astronauts: NASA announced today (Nov. 4) that it will be accepting applications starting in December for its next round of astronaut training. Currently, there are 47 active members in NASA's astronaut corp., with the last group of new astronauts selected in 2013. Applications for the new class will be accepted from mid-December through mid-February, and those selected to begin astronaut training will be announced in mid-2017. The current and upcoming generations of space fliers will be considered for missions to the International Space Station, which has housed human inhabitants for 15 consecutive years, has served as a laboratory for over 1,700 microgravity experiments and offers a way to test the requirements of supporting humans in space (which will be extremely relevant for longer-duration trips to places like Mars). The new classes of astronauts will likely have the chance to fly on two new, commercially made crew vehicles: the SpaceX Crew Dragon and Boeing's CST-100 Starliner, both which are being built as part of NASA's Commercial Crew Program. Looking even further into the future, new astronauts will be considered for trips on board the Orion spacecraft, which could support astronauts in an extended trip around the moon, in preparation for a mission to Mars, the statement from NASA said. Astronaut candidates must have a bachelor's degree in engineering, science or mathematics, with some relevant professional experience or 1,000 hours of pilot-in-command time in jet aircraft. Candidates must also pass the NASA long-duration spaceflight physical. "This next group of American space explorers will inspire the Mars generation to reach for new heights, and help us realize the goal of putting boot prints on the Red Planet," said NASA Administrator Charles Bolden. "Those selected for this service will fly on U.S.-made spacecraft from American soil, advance critical science and research aboard the International Space Station, and help push the boundaries of technology in the proving ground of deep space." You can learn more about NASA's astronaut program here, and come December, submit an application here.